An Introduction to Receptor Modeling (P.K. Hopke). 2. Sampling and Analysis Methods for Ambient PM-10 Aerosol (T.G. Dzubay and R.K. Stevens). 3. Source Sampling for Receptor Modeling (J.E. Houck). 4. Chemical Mass Balance (J.G. Watson, J.C. Chow and T. G. Pace). 5. Multivariate Receptor Models (R.C. Henry). 6. Scanning Electron Microscopy (P.K. Hopke and G.S. Casuccio). 7. Receptor Modeling for Volatile Organic Compounds (P.A. Scheff and R.A. Wadden). 8. Receptor Modeling in the Context of Ambient Air Quality Standard for Particulate Matter (T.G. Pace). 9. Application of Receptor Modeling to Solving Local Air Quality Problems (J.E. Core). Index. This book presents the background and application of receptor models for the source identification and quantitative mass apportionment of airborne pollutants. Over the past decade, receptor models have become an accepted part of the process for developing effective and efficient air quality management plans. Information is provided on the ambient and source sampling and chemical analysis needed to provide the input data for receptor models. Commonly used models are described with examples so that the air quality specialist can see how these models are applied. Recent advances in several areas of the field are presented as well as the perspective of both U.S. Federal and State level air quality managers on how these models fit into the development of a management plan. 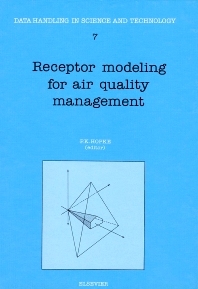 The aim of the book is to provide a practical guide to persons who may be given the task of implementing receptor modeling as a part of some air quality management problem. The intention of all the chapter authors is to furnish both the basic information needed to begin doing receptor modeling as well as some insight into some of the problems related to the use of these models. These tools like any others used in solving complex technological problems are not a panacea, but do represent powerful aids in data analysis that can lead to insights as to how an airshed functions and thus, to effective and efficient air quality management strategies.